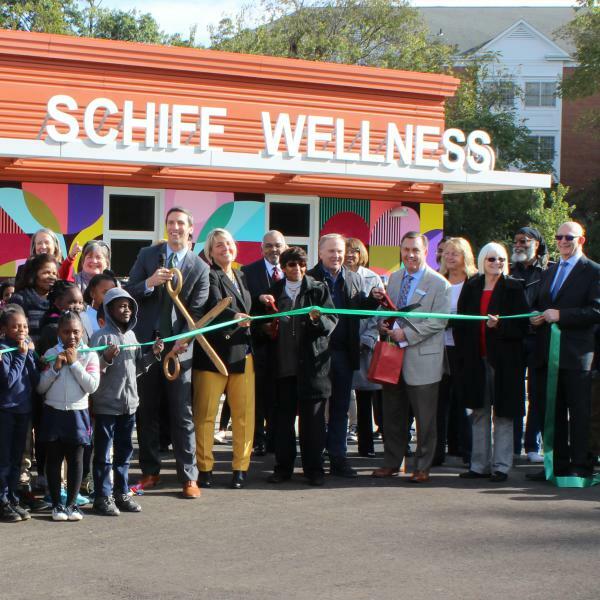 Today, Interact for Health and its longstanding partners Cincinnati Public Schools and the Cincinnati Health Department are opening the Schiff Wellness Center, a comprehensive school-based health center at the Academy of World Languages in Cincinnati’s Evanston neighborhood. It will operate year-round and provide services to the community. The need for these services is great. The poverty rate at the three nearby public elementary schools exceeds 90 percent. More than 1,000 children younger than 5 live in the area. Most of them live below the poverty line. No public health centers serve this community. Previously, students could receive limited primary care services at a school-based health center operated by the health department in office space at the school. But children needing vision or oral health care had to travel to other locations. This led to gaps in health care for children on the East Side of Cincinnati. Fifty percent of children referred for dental services did not receive them, and 8 percent of children who were referred for glasses were unable to access those services. In 2016, planning and fundraising began for this 5,500-square-foot addition to the school building. The school also provides students with resources to obtain nutritious food for their families outside school hours. Additionally, the center will use the existing language and cultural support services available at the school to offer health services to Greater Cincinnati’s growing refugee population, which currently exceeds 11,000. The center cost $2.5 million, which includes construction, furnishings and equipment. Funders include Interact for Health, the John J. and Mary Schiff Foundation, Luxottica’s OneSight Foundation, Delta Dental, MindPeace, John and Francie Pepper, CDS Oral Health Foundation and numerous individual donors.